This procedure synchronizes all apps, music, books and photos between your iPad and iTunes on your computer. Basically means it copies all your apps, music, iBooks and photos between your iPad and your iTunes. IMPORTANT NOTE: This procedure will only work on the computer your iPad is synced with. Do not do this on any computer other than the one you are synchronised with. 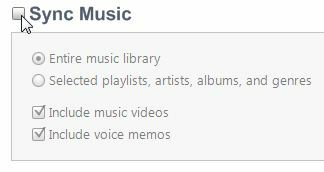 If you aren’t sure you will can continue but do not go any further if iTunes prompts you with an “Erase and Sync” message. 3. Wait for your iPad to appear on the menu in the top right. 4. Click on the “Apps” tab just below the top of the iTunes program. 5. Ensure the “Sync Apps” box is ticked. 7. Click on the “Music” tab in the top menu. 8. Ensure the “Sync Music” box is ticked. 10. Click on “Books” in the menu at the top of iTunes. 12. Click on the “Apply” button at the bottom right. 14. Ensure the “Sync Photos” box is ticked. 15. Click on “Apply” on the bottom right of application.